Very nice work Pat! I'm curious, do you build a 3d model or do you have to draw the plane at 4 different angles? Congratulations on the sale, it's a fantastic representation of the jug. 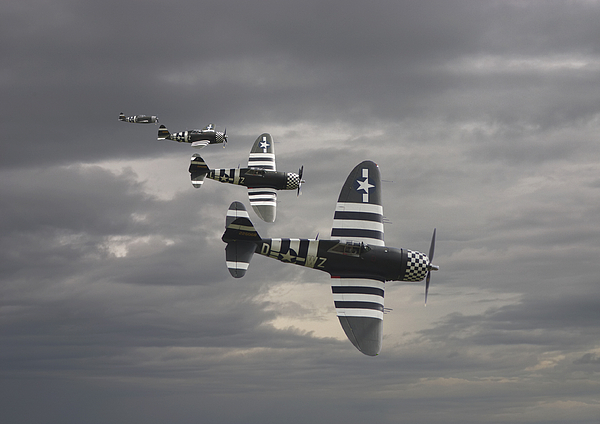 P47 Series Cab Rank The mighty �Jug� dropping down for a ground strafing run during the D-day landing operations. 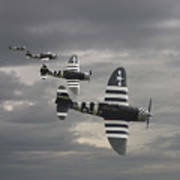 The P47s shown are from the 84th Fighter Squadron based at Duxford and were heavily involved in support of the ground troops. 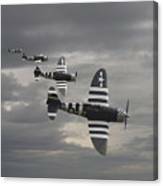 Flying in a holding pattern near the front lines this air support was held in readiness until called in by the Forward Air Controllers based with the army formations - thus the nick-name �cab rank� , admittedly more used by the RAF than the USAAF. 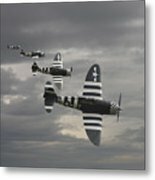 The P47s were eminently suitable for the pinpoint accuracy required in such ground support sorties and caused havoc among the opposing forces. The image depicts a section of P47s, the D-day insignia lit by the watery sun of that poor June weather, sweeping down to answer a ground support call.